If you are considering the upcoming Bandai PG (Perfect Grade) Strike Freedom Gundam, there are few review videos on the Gundam model’s articulation. There are 4 parts in total which feature different parts. Part 1 – PG Strike Freedom Gundam’s Leg & Ankle; Part 2 – Rail Gun, Hip, Upper Body & Lower Body; Part 3 – Shoulder, Arm, Finger, Neck & Dragon Lance (Funnels) & Stand; Part 4 – Backpack (Wings), Rifle, Finger, Runners (Parts) & Overview. Anyway the release date is December 11 2010 in Japan (which is tomorrow). 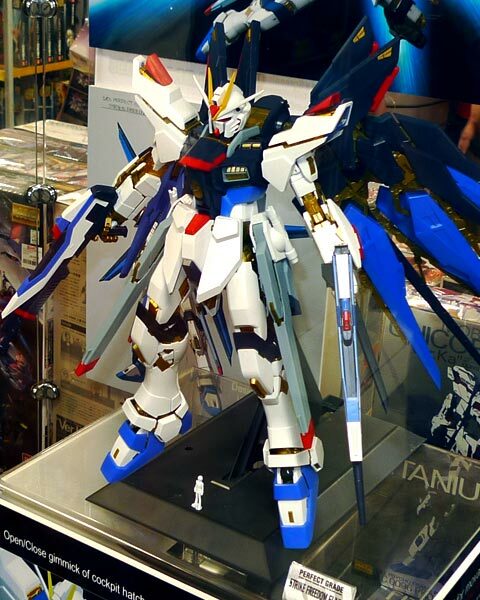 Bandai Real Grade Aile Strike Gundam!